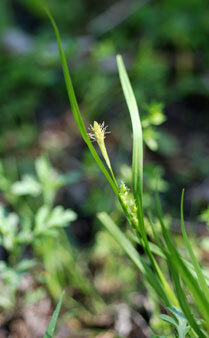 Also Called: Rich woods sedge. Culms: Ascending to spreading, slender, triangular, stiff, rough beneath inflorescence, dark purplish-red at base; sterile shoots present. Leaves: 1-2 per culm, 2/5 to 14 inches long, 1/12 to 1/6 inch wide, usually surpassing the culm, dark green to green; outer surface smooth; margins rough. Sheaths: Tight, prolonged, glabrous; lowermost sheaths brown, tinged purplish-red, rough with pimple-like bumps; uppermost sheaths with well-developed white translucent band on inner surface. Inflorescences: Spikes 3-5 per culm, unisexual, few-flowered; terminal spike staminate, sessile or stalked, .3 to 1.2 inch long, to 1/10 inch wide; lateral spikes 2-4, pistillate, 1/6 to 4/5 inch long, to 2/5 inch wide, widely seperate or overlapping, loosely flowered; uppermost bracts leaf-like, usually much exceeding lateral spikes; staminate scales narrowly oblong, 1/6 to 1/5 inch long, white with green midrib; tips blunt to tapering-pointed; pistillate scales ovate, 1/8 to 1/4 inch long; margins white; midrib green; tip with long, rough-margined awn; perigynia 1-12, loosely spaced to slightly overlapping, arranged alternately in 2 vertical ranks on opposite sides of axis, narrowly egg-shaped, 1/8 to 1/6 inch long, 1/12 inch wide, grayish-green, finely many-nerved, glabrous, tapering to short beak. Fruits: Achene, egg-shaped, 1/12 to 1/10 inch long, yellow-brown, tip abruptly sharp-pointed; stigmas 3. Habitat: Moist to drying deciduous woods, rocky, north-facing slopes above streams; frequently on calcareous substrates. Distribution: Principally in east 1/3 of Kansas.